A new conventus (world-wide meeting) of Roman reconstructionists has just been announced for Poltava, Ukraine. This conventus will be held in conjunction with the group "Res Publica Romana", an NPO from Sweden. The dates are August 1-5, 2012. 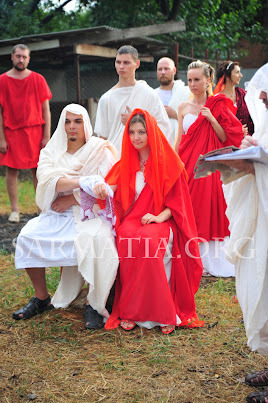 Readers of this blog will remember the Roman weddings and Temple consecration held there two years ago and that Poltava is the site of the temple building project that was attacked by suspected Orthodox vandals. The rite of Suovetaurilia, Consecration of the wider Templum. General Conference. Press-conference for the local media. (Dies Ater) Minor conferences. Tours. (A): A public (citizens) visionary seminar, with the Consuls giving their and the Concilium Curulis vision and a panel asking questions. (B). Meeting of the Concilium Curulis. (C). Consuls and Concilium Curulis meet with as many Sarmatian citizens as possible. Ludi, Pompa, Sacrifice for the good of the Res Publica. Maybe a Collegia or Sacerdotes meeting. 2 Weddings. Meeting of all Senatores present, maybe a public part of the Senate meeting. Private communications. Minor conferences. Departure. Why You Should Not "Worship The Gods"